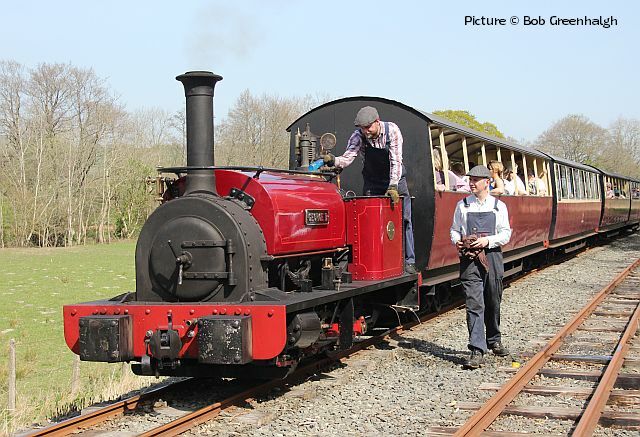 On the Bala Lake Railway, Hunslet quarry loco George B standing in the loop waiting for Maid Marian to pass on her way to Bala. Picture by Bob Greenhalgh. 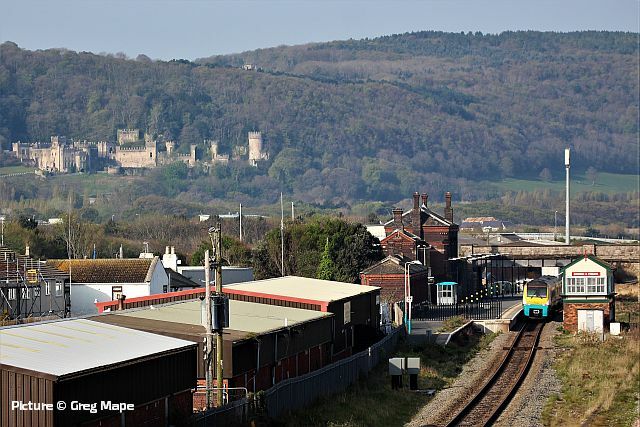 Taken with a long lens on 20 April, the 05:33 Manchester Airport - Llandudno calls at Abergele station, with Gwrych Castle prominent in the background. 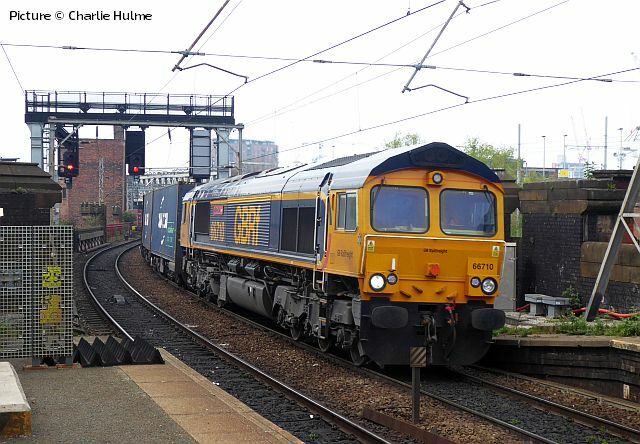 On the same morning, the 07:55 Holyhead - Crewe Voyager races the traffic on the A55 Expressway. 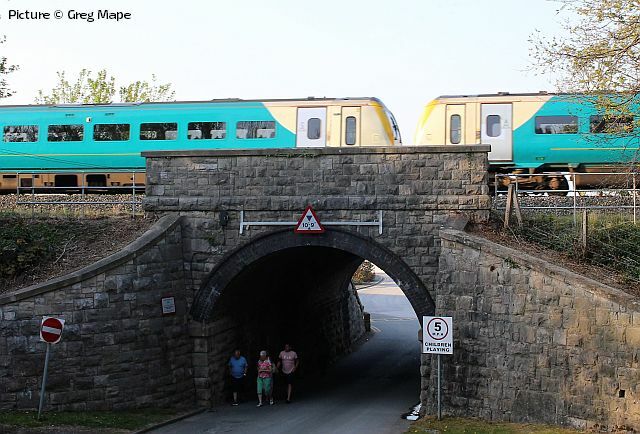 The six-car 17:30 Holyhead - Crewe crosses Beach House Road, east of Llandulas on Sunday 21 April. The Brymbo Heritage Project, devoted to preserve the industrial heritage of the area to the west of Wrexham, is holding a series of Open Days this year. The first is on 28 April - details on their website. 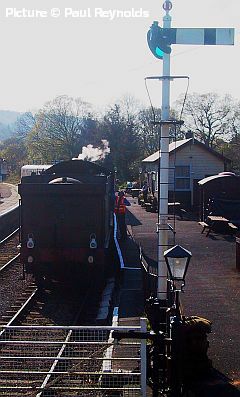 Tuesday 16 April was a misty evening; for the first time for a couple of weeks the logs from Carlisle ran to Chirk. 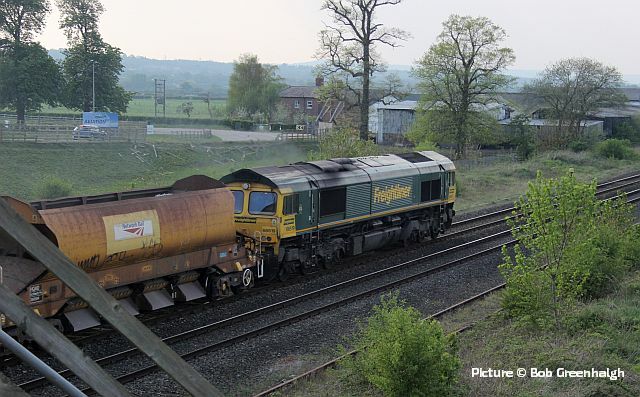 A rather scruffy 70 812 heads the train at Balderton crossing (Bob Greenhalgh). 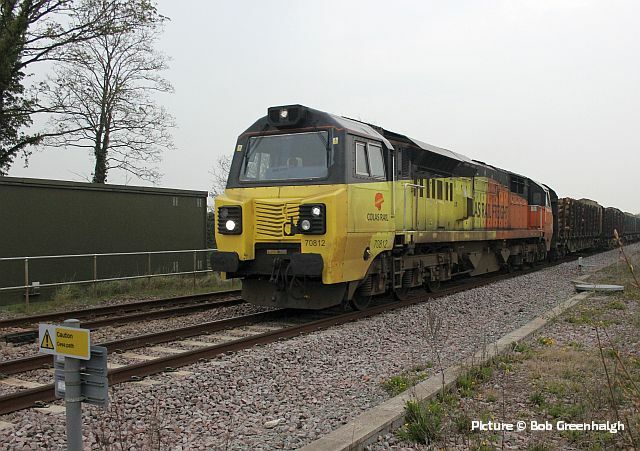 66 519 heads a rake of ballast hoppers as the 16:05 Crewe Basford Hall - Holyhead past Beeches Farm heading for Holyhead, where it was booked to reverse and head for the work site between Llanfair PG and Llandudno Junction (Bob Greenhalgh). 66 518 was on the other end of the train. At 14:18 on 18 April 66 710 Phil Packer BRIT brings the Trafford Park - Felixstowe intermodal through Deansgate station. This busy section now has bi-directional signalling, as the gantry shows. It's hard to imagine this being used in normal circumstances, as passengers would be very confused. 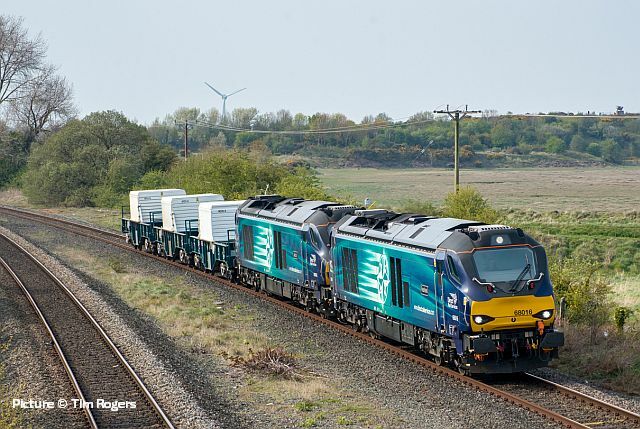 Class 60s are enjoying something of a comeback in the Manchester area, appearing on the Liverpool - Drax biomass flow, as well as the Tunstead - Lostock stone trains such as the one phtographed by Greg Mape near Altrincham on 22 April, hauled by 60 010 which is still used by DB Cargo, but has lost its 'DB Schenker' side logos, as that brand is now obsolete. forming the 6K41 14:57 Valley to Crewe Flask train. 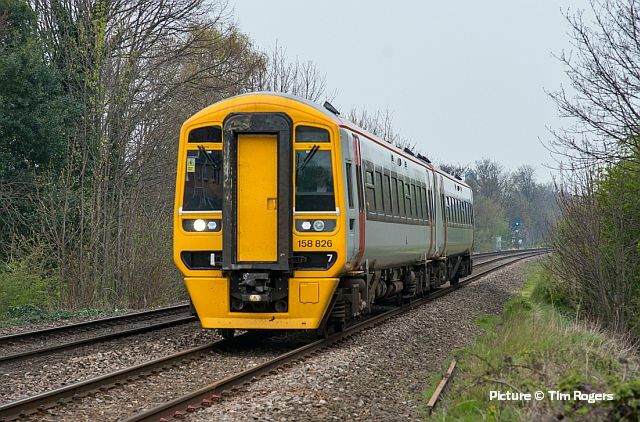 These de-fuelling trains are scheduled to cease running in 'mid to late 2019'. 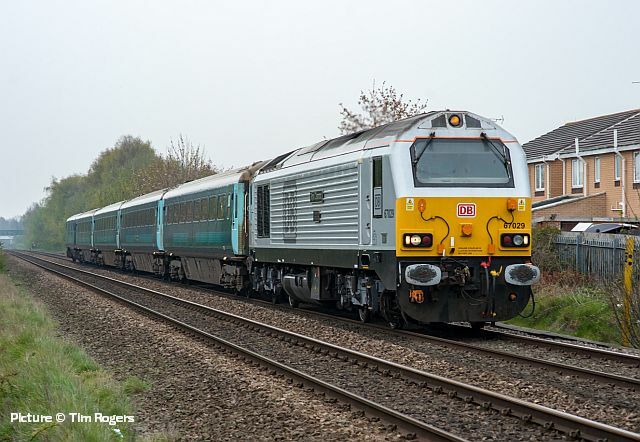 Seen from Maude Street foot crossing, Connah's Quay on 16 April, re-liveried by un-branded 158 826 working 1G32, 09:23 Holyhead to Birmingham International. 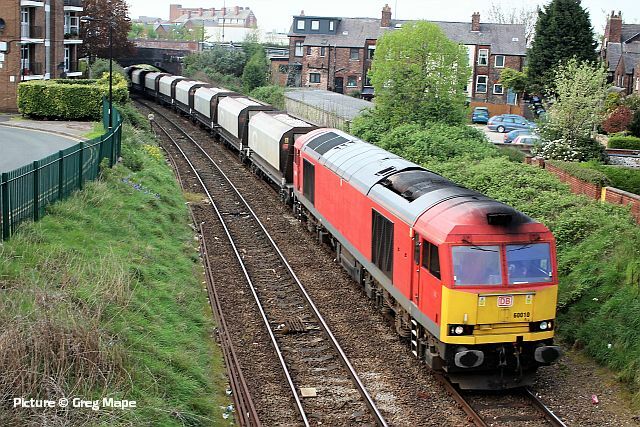 67 029 Royal Diamond had taken over the Manchester loco-hauled diagram by 16 April, when Tim photographed from Maude Street the 1D34 09:53 Manchester Piccadilly to Holyhead, formed of Mk3a coaches, 12182, 12185, 12177 and 12183 with Driving Van Trailer 82308. 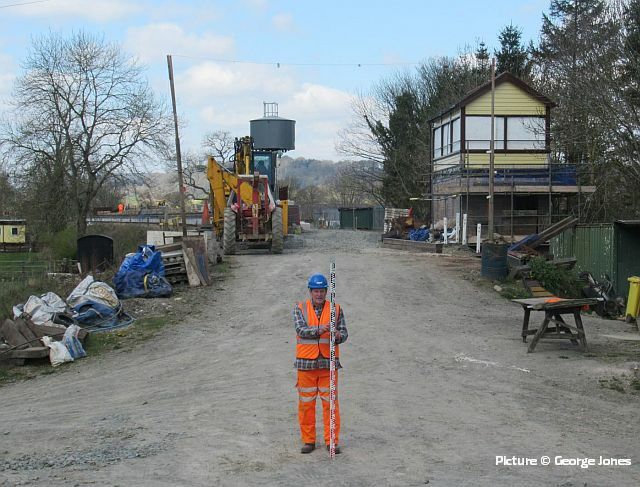 Work has at last started on infilling the infamous gap in the embankment at Corwen on the Llangollen Railway's extension. The profile of the Gap is complex due to the original passageway, as bulldozed through to the sewage farm, having been eroded over time. 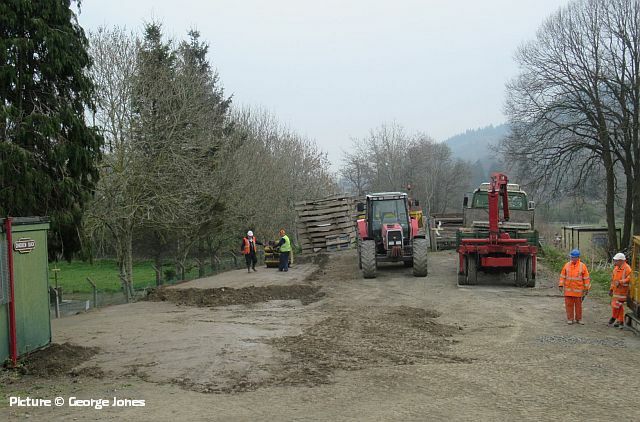 The infill material was brought in from the former Ruthin branch embankment using a route through the unfinished island platform. Phase 1 involved closing the area in front of the former access to the sewage farm gates where the total depth to be infilled was 10ft (3 metres) to re-establish the line of the northern embankment. The dumping of loads of 5 or 10 tonnes of material infill was spread, layered and rolled by a team of volunteers and at the end of the first day the infill had reached around 7ft in depth. Day 2 saw the level built up and spread across the shallower depth of the gap, but still some way below the track bed level and dumping and levelling continued into day 3 on the centre section. By end of play on day 4 the northern (or River Dee) side of the Gap had been brought up to track bed level over a length of 40 metres/130ft. 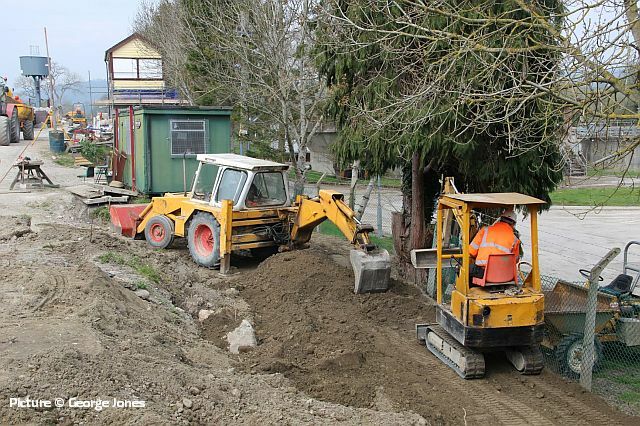 The need to allow wheeled vehicles to manoeuvre has kept the access open on the southern ( or A5) side of the site as, for the final stage, the plan is to lift the mess room and work shop container out of their spaces to new positions. 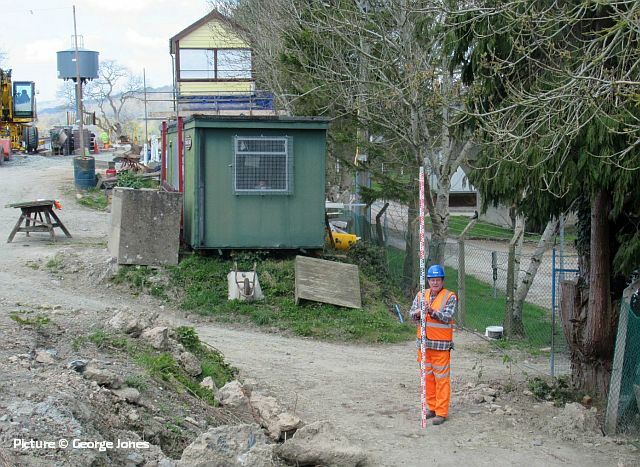 This will allow the remainder of the northern embankment to be brought into line as far as the signalbox and further infilling for the remainder of the gap will follow during an exercise in May. 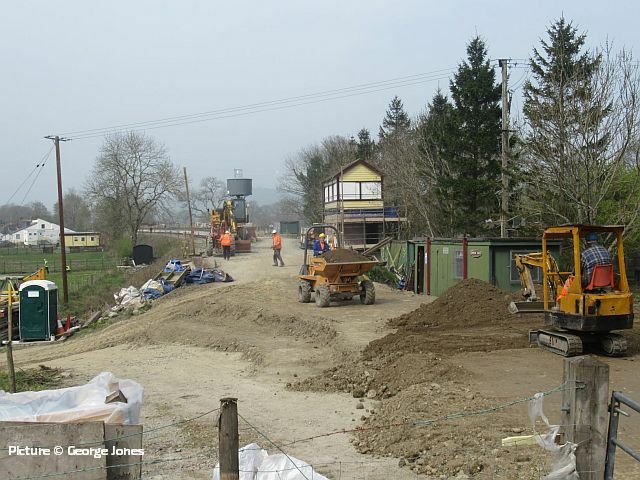 The reinstated embankment will be wide enough to take the main running line and a siding when track laying takes place. 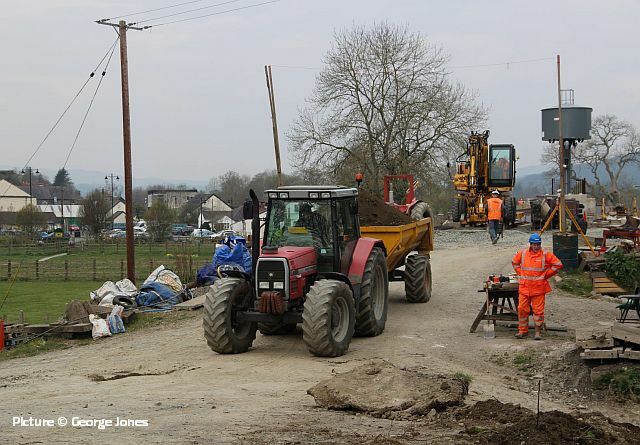 For now the workforce is taking a well-earned break over Easter and thanks are due to the tremendous volunteer effort without which this work would not have been completed. The infilling was able to go ahead after it was announced the Infill the Gap appeal had passed the £10k target thanks to donations from supporters and well wishers, with a useful £500 coming from the success of a charity raffle by the Corwen townsfolk, Thanks are due to all those who sent in donations which came from near and far to help overcome this final obstruction on the route into the Corwen terminus. 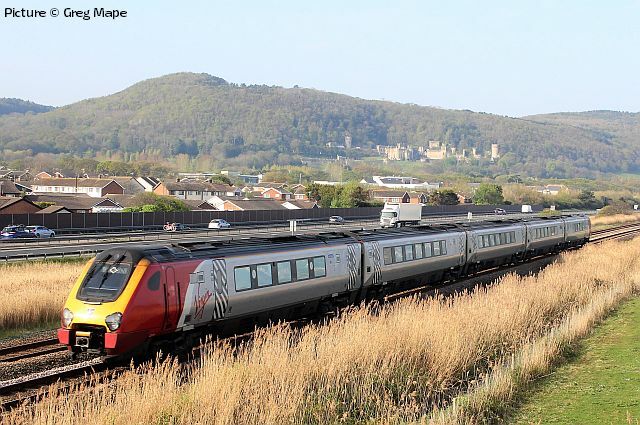 On 17 March the 'Salopian Express II' was a West Coast Railways railtour, this time staring from Dumfries and visiting the historic town of Shrewsbury, picking up passengers from Annan, Gretna, Carlisle, Penrith, Lancaster and Preston. 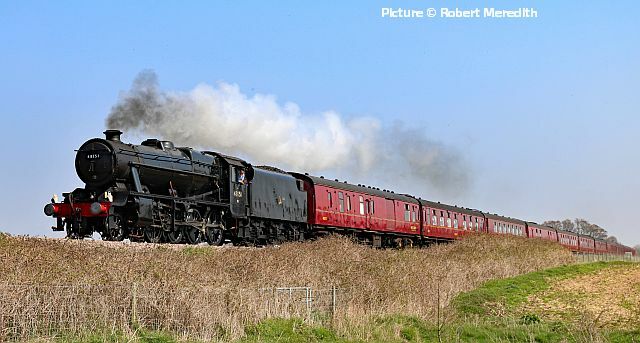 It was diesel-hauled from Dumfries to Carnforth where where LMS 2-8-0 Stanier 8F 48151 was attached for yet another mainline outing, the engine the stalwart of Carnforth’s locomotive fleet was hauling 11 coaches, and this time with no diesel attached at the rear. Above, heading for Shrewsbury 48151 approaches Willaston level crossing; the excursion was following behind a late running Manchester Piccadilly to Carmarthen service train. Picture and notes by Robert Meredith. 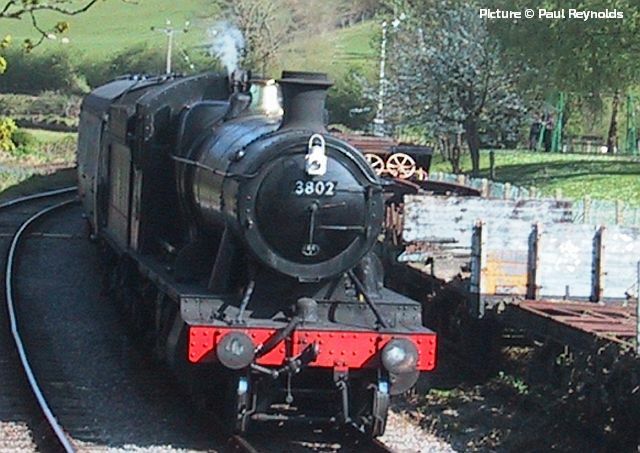 Paul Reynolds, signalman at Glyndyfrdwy on the Llangollen line, captured the view from the Box as 2-8-0 3802 arrived to exchange single-line tokens on 21 April. By coincidence we have recently received two images of the London and North Western Railway's boundary markers, of which many thousands must have been cast - perhaps at Crewe works foundry, in the 1800s. The example above left is near Llandudno (Tim Rogers), while the central one is near Llanfairfechan (Greg Mape). The one on the right, from our archive, is at Lancaster station, and shows a slightly different configuration.